Reference number for this case: 7-Jun-54-Marseille. Thank you for including this reference number in any correspondence with me regarding this case. 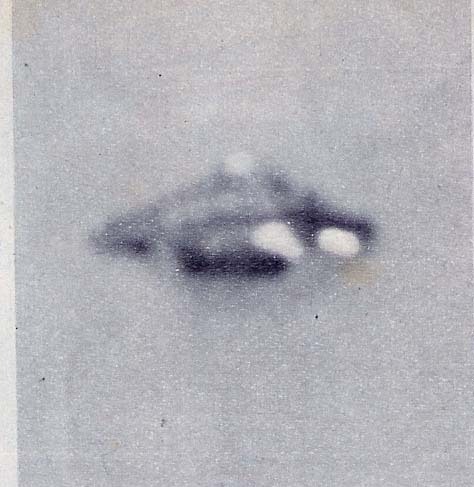 The caption only says "50 Object seen June 7, 1954, near Marseille". The comment of the blog where this picture appeared indicates that it was published in "Semaine du Monde" for the week of October 1st to October 7, 1954 #99." "Thus France, in its turn, will give to the problem a national interest. But already we pour in the file the first photographs taken in France. All three were taken by two correspondents of our newspaper, Misters L. Alyons and J. Ates. The fact that they were photographed in the sky of Marseille does not allow to infer anything as for the nature of the phenomenon." "That of the left, caught on last May 26, at 06:30 p.m., "enormous, remained fixed at low altitude while making the window of the room vibrate" before fleeing suddenly. In top on the left: June 7, this apparatus lenghtily showed itself to the teleobjective. On the right: August 22, this apparatus, resembling also like a brother to a flying saucer hesitated a long time, sometimes coming down as low as 100 meters and sometimes going up vertically, to land over the hills of Marseilleveyre for the evening pastis. Did the indifférence expressed by the residents of Marseille seem suspect to the mysterious travellers?" Reading my "hoax" explanation, a French ufologist colleague commented on April 24, 2008, on a ufology discussion list I am member of that he too, thinks that this pictures and three others by the same people are probably fraudulent. He said that this one made him think a lot of photography face of a young woman whose mouth only would be visible, lips covered with lipstick, and that it seems to him to distinguish the beginning of the nose. 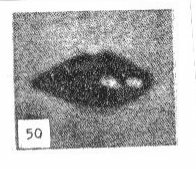 The image and its references were reported by a Spanish ufologist on a ufology mailing list in 2008, as coming from Karl Veit in "Flying Saucers". Karl L. Veit was a German ufologist with a tendency to believe just about anything such as the lies of US "contactee" George Adamski; this and the lack of information make it likely that the image is a hoax and/or maybe not from the indicated place and time. I then found (April 17, 1954) on a web blog a long collection of articles coming from my own site, not credited and deprived of the links to my corresponding case files, but also among those, the transcription of the article indicated to be of "Semaine du Monde" and the image presented here, which I did not have in my collection. The fact that all four "flying saucers pictures" come from the same people though at four different dates highly suggests that they are all hoaxed. On August 27, 1954 in Marseilleveyre. [---] Article in the general information magazine Semaine du Monde, France, #99, October 1-7, 1954. [kv1] "Saucer Photorama", article by Karl L. Veit, in Flying Saucers, pages 55, 72, July 1962. 0.1 Patrick Gross April 17, 2008 First published. 1.2 Patrick Gross January 17, 2010 Addition [jd1]. 1.3 Patrick Gross March 18, 2010 Addition "Note".